Hi Cyndee, I am wondering what you charge for a presentation on your book. I belong to the Schaumburg Branch of The American Association of University Women and wan interested in your presentation possibly for one of our meetings. Thank you so much for your message and interest in my program. I would enjoy presenting my program to the Schaumburg Branch AAUW. I am a member of the Glenview Branch. We can discuss my fee and work it out. Email me at cyndeeschaffer@gmail.com and we can discuss this further. 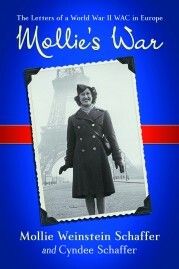 You can purchase Mollie's War through Amazon or direct from the publisher, McFarland Publishing.